Hi everyone! I had wanted to try out the Herringbone pattern for a while. Finally, here it is! I absolutely adore the color combination. Prep: Cut all of the nail strips that you will need, using scotch tape. 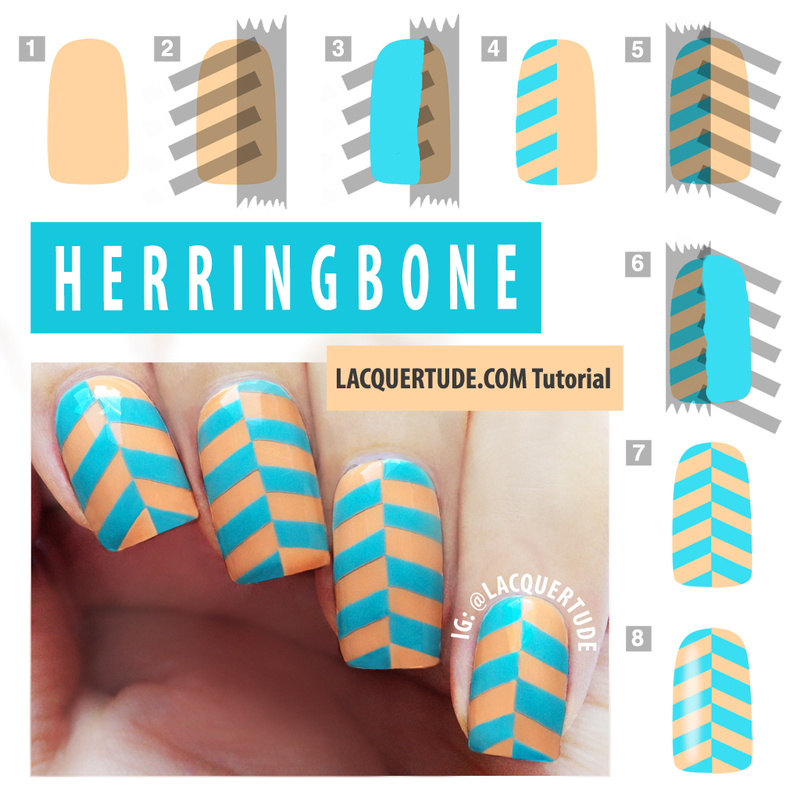 4 regular width pieces per nail, and skinny strips that you will make the herringbone pattern with (the number of strips will depend on how wide you want the design and the length of your nail). 1. Pick 2 colors. TIP: pick polishes that are opaque and where color 2 can easily layer over color 1. Start with your favorite base coat, then paint your first color and let dry completely (or if you’re impatient like me, apply quick dry top coat here). 2. Cover right half of your nail with regular width tape. Then tape off desired number of thin strips across the left half of your nail at around 45-degree angle. Make sure to evenly space them the same width of your tape. 3. Fill left half of your nail with the second color. 4. Immediately peel off the tape, thin strips first. Then you’re left with the design of half herringbones! Let dry completely (or quick dry top coat!) TIP: To get crisp and clean edges, use tweezers and pull the tape in a straight perpendicular direction to avoid lifting edges of your nail polish. 6. Fill in second color on the right half of your nail. 7. Repeat step 4 and your herringbone pattern is complete!! 8. You did it! And well done! Now apply topcoat to seal and protect your design and enjoy! (or brag to your significant other and BFF if you’re like me). Do you like this design? If you recreate it, don’t forget to tag @lacquertude and hashtag #lacquertude on Instagram and you can follow my account here, or post your photo on my Facebook wall. Maybe I’m reading your instructions incorrectly, but it looks to me like it creates a chevron pattern not a herringbone.